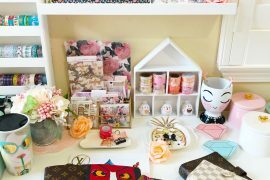 Hello everyone – Karen Ellis here today on the Creative Scrapbooker Magazine blog. I’ve been having a lot of fun playing with some pretty cool foil products from Therm O Web lately and I wanted to show you one of the cards birthday cards I’ve created using it. I wish photos did these foiled products more justice. They are awesome! The whole Gina K Designs line works so nicely together and each package comes with many sheets making it really easy for those who also like to mass produce or even coordinate invitations! But, before I get too ahead of myself, let me show you how I created this particular card. 1. While your laminator is heating up, prepare the elements you’d like to foil. Cut the wavy Foil Mate sheet to measure 4.25”x5.25” and set aside a piece of turquoise Fancy Foil just l touch larger to cover it. 2. Using your favourite die cutting machine, cut your favourite sentiment from the Birthday Essentials sheets using the larger rectangle die in the set. 3. Stamp two outline balloon shapes with the balloon clear stamp using the yellow distress ink. Then, cut out the Happy Birthday banner, one solid balloon and the two stamped outlined balloon shapes from the Time to Celebrate set. Set aside. 4. While you have your die cutting machine out, go ahead and cut a small rectangle shape from the turquoise cardstock using the mid-size double stitched rectangle die. This will be used for the front of the card when you assemble it later. 5. Place your Foil Mate sheets in a folded piece of parchment paper with the turquoise foil right side up (as per manufacturer instruction) and run it through the preheated laminator (be sure to place the parchment paper into the laminator folded side first). Once through the laminator, remove the foil sheet and see the beauty that remains. I love the professional look this foiling technique gives!! 6. 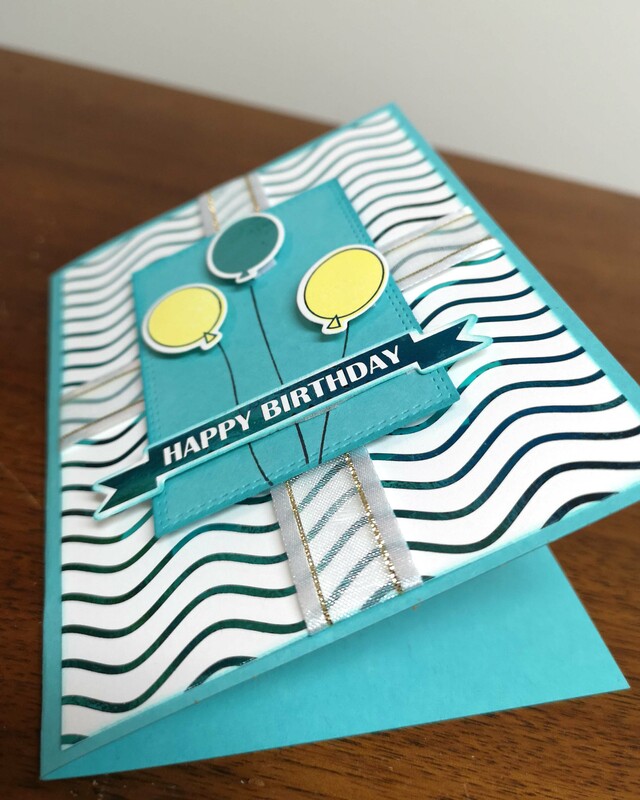 Fold an 8 ½”x5 ½” sheet of the turquoise cardstock in half to create the card form. Ink the edges of the of the cut pieces with the Peacock Feather Distress Ink and stamp 3 balloon strings with the clear stamp set and Black Soot Distress Ink on the small turquoise piece of cardstock you cut out earlier using the rectangular die. Now your ready to assemble as shown and don’t forget to add that foil a sentiment for the inside of your card too! I am so pleased with how easy and professional looking these foiling products are. They’re so much fun and so very shiny! Makes me happy! I hope you pick some up and try for yourself! Have a great day everyone! See you in the pages of the magazine! This is such a fun card with a gorgeous colour palette.